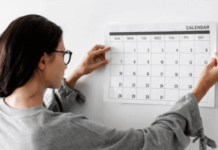 What is a multimodal bill of lading? How to use a multimodal bill of lading in a letter of credit transaction correctly? Multimodal transportation is the movement of one unit load from origin to destination by several methods or transportation under one document without breaking up the unit load. 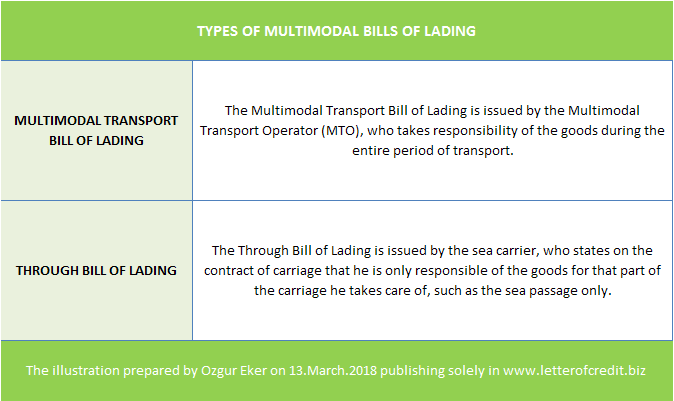 Multimodal bill of lading is a transport document that is evidencing more than one mode of transport, one of which is typically by sea shipment, although it is not required. Bill of lading for combined transport is another name of the multimodal bill of lading. MMBL (Multimodal Bill of Lading) or MMTD (Multimodal Transport Document) are the most frequently used abbreviations. 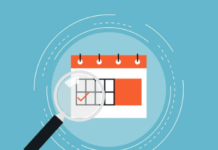 Multimodal bills of lading can be classified under two main types: multimodal transport bill of lading and through bill of lading. Multimodal Transport Bills of Lading: These types of multimodal bills of lading are issued by a multimodal transport operator and mostly printed on FIATA (International Federation of Freight Forwarders Associations) standard pre-printed form. Multimodal transport operator (MTO) means any person who concludes a multimodal transport contract and assumes responsibility for the performance thereof as a carrier for the whole journey. Through Bills of Lading: Through Bills of Lading are virtually identical to the Multimodal Transport Bills of lading but with one major difference. The Multimodal Transport Bill of Lading is issued by the Multimodal Transport Operator (MTO) (shipping lines, freight forwarders, NVOCC Operators) who takes responsibility of the goods (e.g. shortages, losses, damages) during the entire period of transport, thus not only for the sea passage but also for the other transport modes as well. The rules related to the multimodal bill of lading can be found under article 19 of UCP 600.
indicate that the goods have been dispatched, taken in charge or shipped on board at the place stated in the credit. be the sole original transport document or, if issued in more than one original, be the full set as indicated on the transport document. contain terms and conditions of carriage or make reference to another source containing the terms and conditions of carriage (short form or blank back transport document). In all places where the term “multimodal transport document” is used within this document, it also includes the term combined transport document. If a credit requires presentation of a transport document covering transportation utilizing at least two modes of transport … the transport document must not indicate that shipment or dispatch has been effected by only one mode of transport. 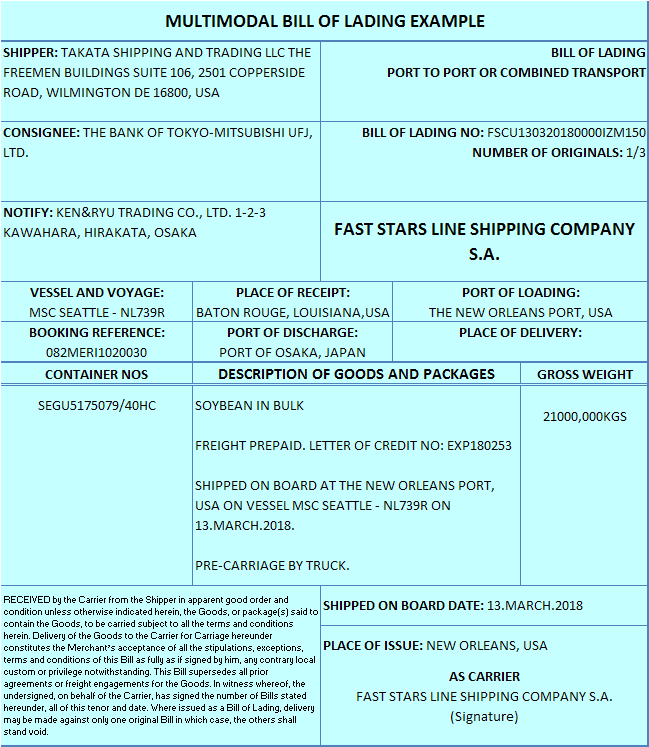 You can find a multimodal bill of lading example below, that is evidencing a soybean shipment from USA to Japan. Above multimodal bill of lading evidencing both road and sea transportation. It is most probably issued by a freight forwarder, because of the fact that the transport document has been signed “As CARRIER”. Document Issued or Countersigned by the Applicant: What are the Risks?